Science books on my wish list. So what have you all been up to? As I write this we are having our second thunderstorm this week. This may not seem unusual to most, but here in N. Nevada we do not often have these. Our electricity is going off and on and we may get some flooding. I love rain so I am enjoying the weather but can live without the flickering lights. The storm is supposed to last a few days; hopefully no one is hurt or the flooding harmful. I love that that my trees and plants are getting a lot of water; we are a desert so any rain is to be celebrated. I have been busy with school and in my new capacity as a copy-editor. I am enjoying my second job but as you may have noticed, it is taking time away from my first loves; reading and blogging. As long time followers know I am a huge fan of podcasts. I love to listen while I work. Since I have not been reading much lately I decided to catch up on some book related podcasts from NPR. Wow, I had no idea so many good science books have come out in the last few months! I researched a few titles and thought I would share them with you. All of these are on my wish list. Are they on yours? What science books have you read and recommend? Help me grow my science list; the holiday season is just about here and I need some titles for my list. The opening chapters set up the discovery of quantum entanglement, which occurred during the professional debate between Max Bohr and Albert Einstein as they discussed the nature of quantum physics. 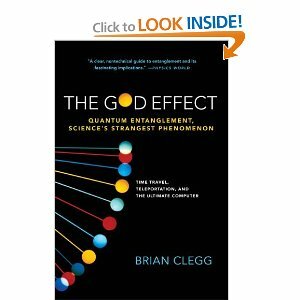 Clegg then provides historical understanding and the potential applications of entanglement to advance current technologies. Those chapters read like a science-fiction novel–an unbreakable secure communications system, teleportation, and supercomputers that think all become possibilities. 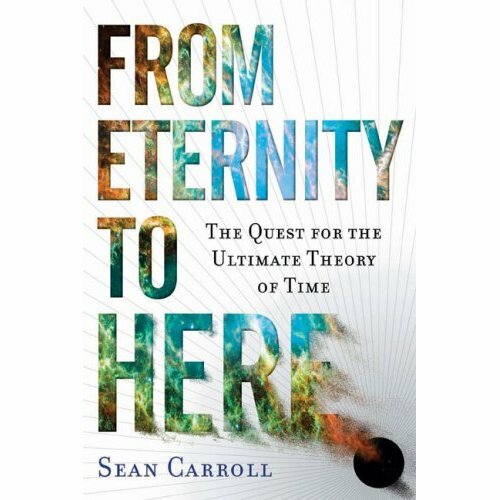 by Sean M. Carroll. I listened to a half hour interview with Carroll who explains what time may really be (Einstein may be wrong) and what this means to our world view. 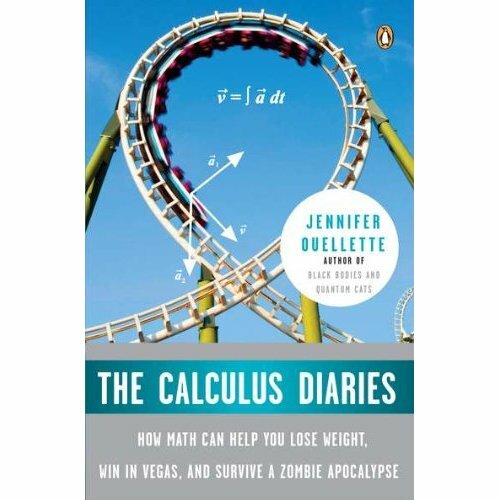 The Calculus Diaries: How Math Can Help You Lose Weight, Win in Vegas, and Survive a Zombie Apocalypse by Jennifer Ouellette. Now I do not usually read math books but this may help me understand why we need math and how it is all around us. Math scares me but Jennifer insisted she wrote the book for people just like me. Oddly enough she is married to Sean Carroll. He is the geeky science husband she talks about in her book. by Sam Kean . I had to laugh when I first heard Kean being interviewed. Writing a book about Periodic Table, seriously? Oh, but he had such great stories all connected to the elements. Science magazine reporter Kean views the periodic table as one of the great achievements of humankind, “an anthropological marvel,” full of stories about our connection with the physical world. 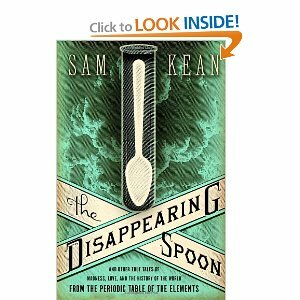 Funny, even chilling tales are associated with each element, and Kean relates many. The title refers to gallium (Ga, 31), which melts at 84ËšF, prompting a practical joke among “chemical cognoscenti”: shape gallium into spoons, “serve them with tea, and watch as your guests recoil when their Earl Grey ˜eats™ their utensils.” Along with Dmitri Mendeleyev, the father of the periodic table, Kean is in his element as he presents a parade of entertaining anecdotes about scientists (mad and otherwise) while covering such topics as thallium (Tl, 81) poisoning, the invention of the silicon (Si, 14) transistor, and how the ruthenium (Ru, 44) fountain pen point made million for the Parker company. With a constant flow of fun facts bubbling to the surface, Kean writes with wit, flair, and authority in a debut that will delight even general readers. The total science nerd in me wanted to leave work and rush to buy this book. Sadly, Borders does not carry it, so I will have to order it, if I do not get it as holiday gift. See I am trying to hold off on buying any books before December, but oh this one has me wanting to push the “buy it button”. Next Next post: The 101 Most Influential People who Never Lived: who would be on your list?